This stylish, multi-functional printer is ideal for home users, whether you’re a home office worker or simply in the market for a high functioning, high quality printer to use from home. This is Canon’s latest iteration in the Pixma range and they’ve certainly stepped up their game. Not only is the Canon Pixma TS9055 30% smaller than its predecessors, making it even more compact, but it’s also the most stylish machine on the market. 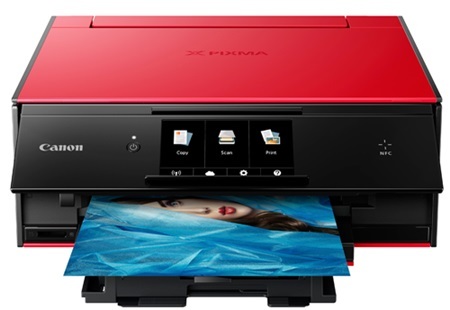 The Canon Pixma TS9055 comes in a chic black and red finish, with a matte red top and otherwise matte black body. It has a 12.6cm touch screen display which is not only easy to read but very easy to use with an auto-tilt function. The printer has an auto expanding output tray, dual paper feeders and measures roughly 37.2 x 32.4 x 14cm and weighs an approximate 6.7kg. The size and weight of this printer make it perfect for home use, and it would look great in a stylishly designed home office or study. This printer’s main advantages are its compact size and multifunctionality, but it has also been designed with the future in mind and not only is it completely wireless, but it can print straight from your social media accounts such as Facebook and Instagram using the touch screen display. Use cloud services to print right from your mobile devices, or alternatively use the SD card slot to print photos straight from your memory drive. You can even crop, edit or add filters while using the printer. This all-rounder can also scan and copy, making it a great investment for the home or small office. This is a brand new model from the Pixma range and as such we don’t yet know how well it works once out in the wild, but its features and functions indicate it will be great for home use.